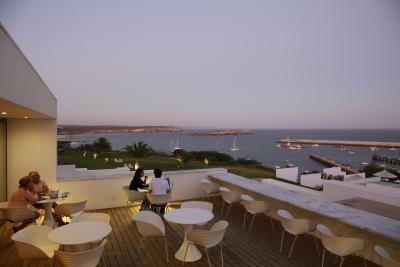 Lock in a great price for Memmo Baleeira - Design Hotels – rated 8.8 by recent guests! Breakfast is excellent, staff very friendly. Rooms are chic and clean. Excellent breakfast. Beautiful views. Friendly staff. Large rooms with a lot of amenities provided. Everything! 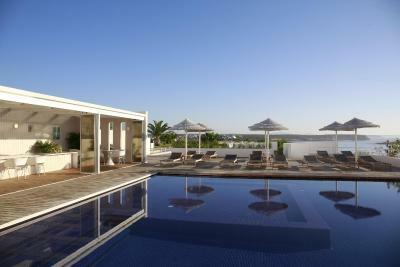 This is my favorite hotel in Portugal. Beautiful hotel on the ocean. Great room with view to die for, great staff, delicious food. Love this hotel. 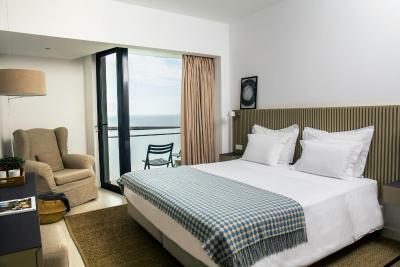 A lovely sea view room with an extremely comfortable bed. A beautiful location. Easy walk to the beach. Peaceful setting. Small, laid back town. 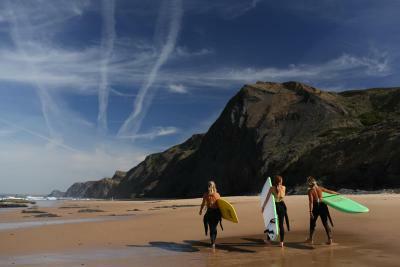 Some great beaches nearby. 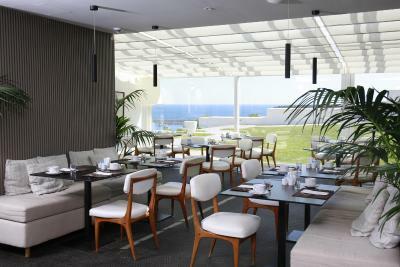 Exceptional breakfast buffet that caters for food intolerances. 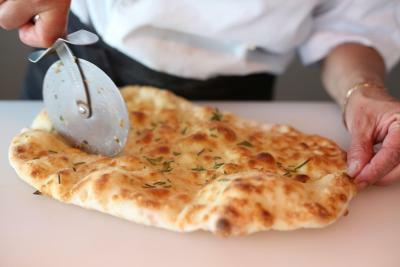 Great food in the restaurant. Pleasant pool area. Staff, especially Luis, were extremely friendly and helpful!!! Restaurant looked really good and bar was hopping at night. Beautiful pool, view and nice grounds. Enjoyed the sauna and indoor heated pool!!! 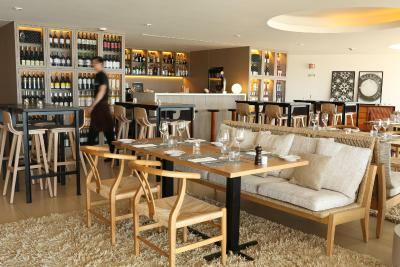 Great setting, hotel bar and restaurant and facilities! We spent a part of our honeymoon here and it was wonderful! Everyone was so friendly and our stay was wonderful! We really enjoyed our honeymoon here! Excellent location, walking distance to town & great food! Staff was amazing and always ready to help. Very comfy and quiet place to rest with your loved one. Amazing sunset and sunrise. Memmo Baleeira - Design Hotels This rating is a reflection of how the property compares to the industry standard when it comes to price, facilities and services available. It's based on a self-evaluation by the property. Use this rating to help choose your stay! 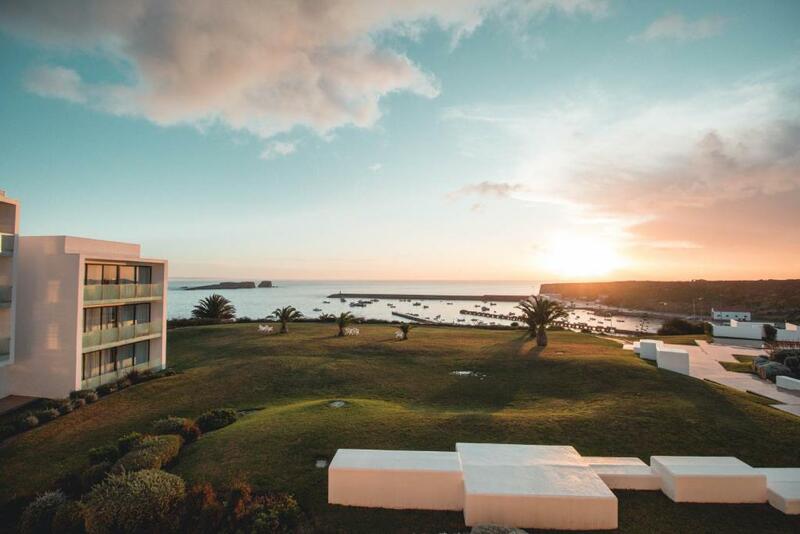 One of our top picks in Sagres.Located in the green surroundings of the Costa Vicentina Natural Park, the Memmo Baleeira offers an outdoor pool with magnificent Atlantic Ocean views and rooms with private balconies. 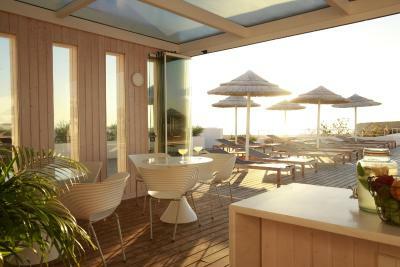 All guest rooms of the Baleeira Hotel offer views of the sea or garden and luxurious Memmo bathroom amenities. Each includes a seating area with a flat-screen TV. Some rooms have a private balcony. Guests can relax in the spa and enjoy the heated indoor pool, Turkish bath and sauna. Guests can also pamper themselves with various massages. 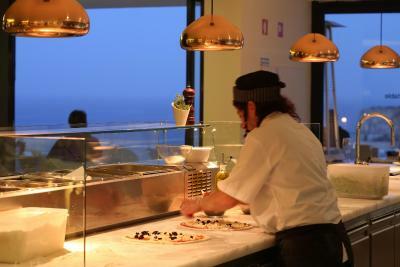 Baleeira has a traditional Mediterranean restaurant and a "Fornaria", serving tasty homemade pizzas, cooked in a wood-burning oven. 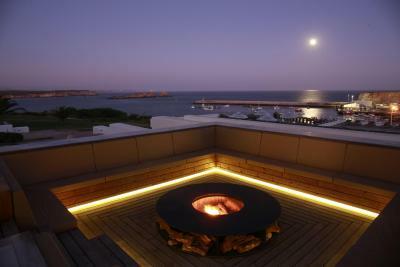 The "Fornaria" offers stunning views of the bay. 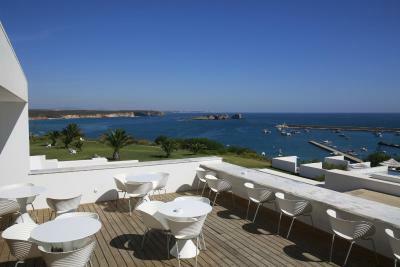 The historical center of Sagres is 650 feet away and it takes a 5-minute walk to reach both Tonel and Martinhal Beach. 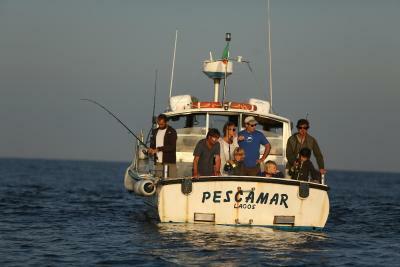 The Fortress of Sagres can be reached in a 5-minute drive. For children the hotel has a Kid’s club. 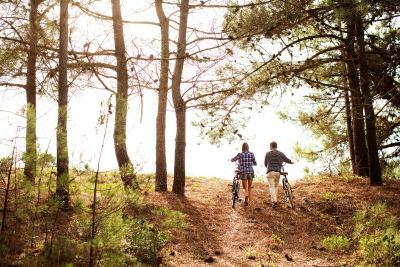 The Memmo Baleeira also offers help in arranging various outdoor activities for its guests, including surfing, diving, biking and golf. 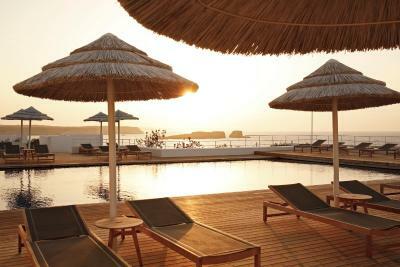 This property also has one of the top-rated locations in Sagres! Guests are happier about it compared to other properties in the area. 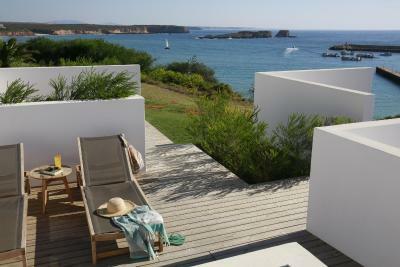 When would you like to stay at Memmo Baleeira - Design Hotels? 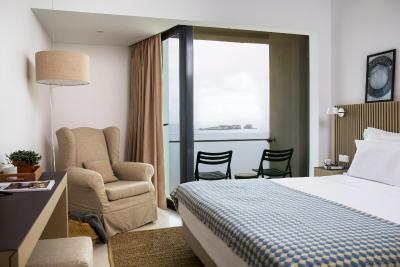 This spacious and air-conditioned room features partial views of the Atlantic Ocean. It comes with a flat-screen cable TV and mini-bar. The bathroom includes toiletries and a hairdryer. 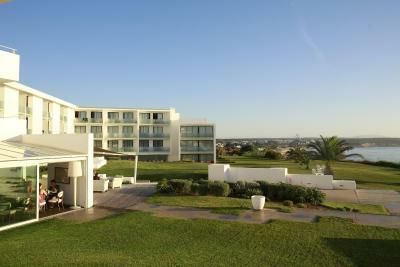 This spacious suite features views of the village of Sagres, and includes a kitchenette and separate living room. Please note that a 3rd adult is possible, upon request and confirmation by the hotel. Extra charges will be applied. 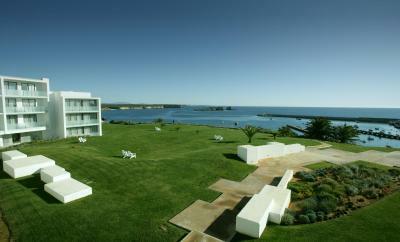 This spacious suite includes a kitchenette, a separate living room and views of Baleeira Bay. Spacious and air-conditioned room with a flat-screen cable TV and mini-bar. The bathroom comes with toiletries and a hairdyer. 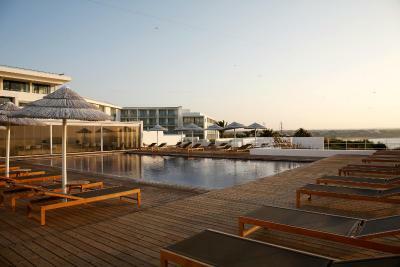 This large Suite includes 2 bedrooms, a fully equipped kitchenette and views of the Atlantic Ocean. Please note that the rate is based on 4 guests. Maximum occupancy is 5 adults (sleeping in a sofa bed) or 4 adults and 2 children under the age of 12 (sleeping in a sofa bed). This spacious room features views of the Atlantic ocean. Each room has air conditioning, a flat-screen TV and mini-bar. This spacious suite features a balcony with views of the hotel gardens. Each has air conditioning, a flat-screen TV, and a kitchenette with a fridge and a microwave. 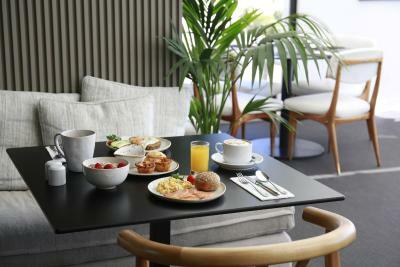 House Rules Memmo Baleeira - Design Hotels takes special requests – add in the next step! 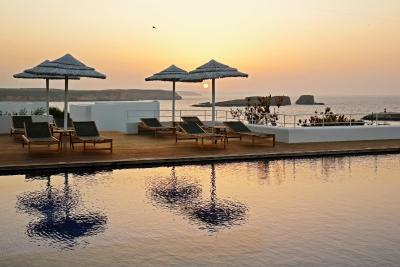 Memmo Baleeira - Design Hotels accepts these cards and reserves the right to temporarily hold an amount prior to arrival. It is recommended that families traveling with children over 3 years-old stay in Suites. At check-in, guests will receive the Memmo tourist guide with information on the best that Sagres has to offer (restaurants, bars, shops), and the Memmo bracelet that will enable them to get discounts or special offers in several places. Please note that in case of early departure, the full amount of the reservation will be charged. There is a maximum of 5 rooms per booking. Reservations with more than 5 rooms are subject to different conditions and will be handled on a case-by-case basis by the property. Spa was closed but run in a room on the top floor and some treatments were not available. There was some renovations going on but this didnt effect us. The finner. Good was not Good. The fish and chocken was frozen and not fresh and overcooked all times. Sauces not good. Would have expected fresh fish from the sea. Vegetables ok. The location. The view. The breakfast. 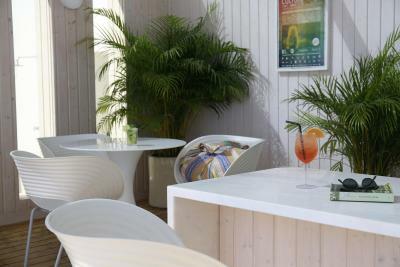 The lounge. The hotel was very welcoming with the lovely staff and a light and fresh decor. 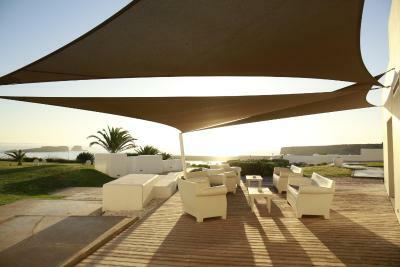 The location was brilliant, short walk to the surrounding beaches and main street of Sagres. 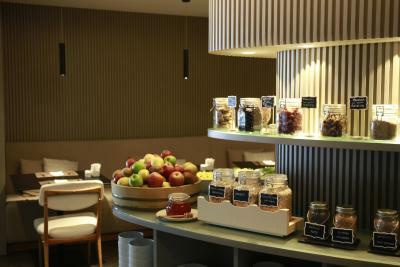 The breakfast buffet was amazing with a good selection of hot food, danishes, healthy bits and nice coffee and juices. 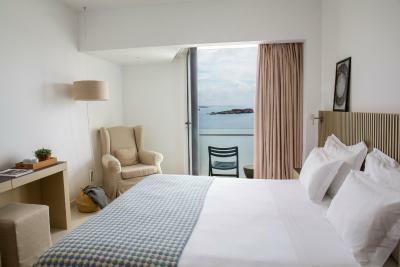 The room was lovely and clean with a nice view of the fishing harbour and really comfy bed. 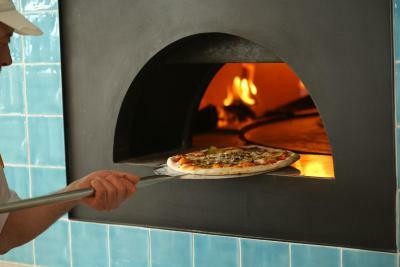 The restaurant offered good lunch/dinner options - the pizza we had one night was delicious. 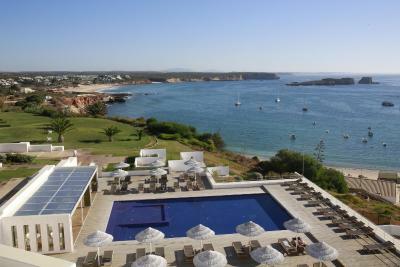 The staff were always very helpful and this hotel could not have been a better find- really pleased to have stayed here, it really made our trip in Sagres. A rather cocky waiter wearing braces slapped down my bill at dinner & said 'your very expensive check', laughed, looked at his colleague who also then laughed. Made me feel that I was being ripped off & they knew it. I didn't eat at the hotel restaurant again. Only criticism would be that the walls were not very soundproof and on occasion could hear the people in next room. A lovely hotel, very quiet and relaxed. Rooms were smart with a lovely sea view. Bed was very comfy. Staff were exceptionally friendly. Very calm and peaceful environment around the hotel. Some lovely walks and a short distance from the town centre. Enjoyed relaxing on the terrace and around the pool. 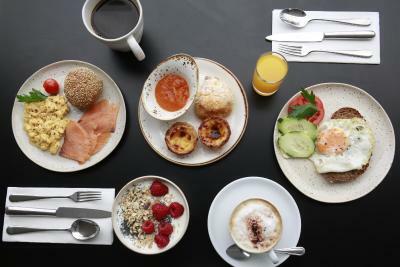 Breakfast was very good with a great selection. Would definitely visit again. The restaurant was not what you can expect for this kind of hotel. The swimming pool was not deep enough. 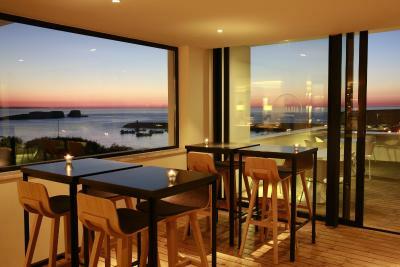 The location and the style of the hotel. The breakfast was delicious. Some of the lights and power outlets in our room didn't work. The staff ws extremely friendly and eager to help. 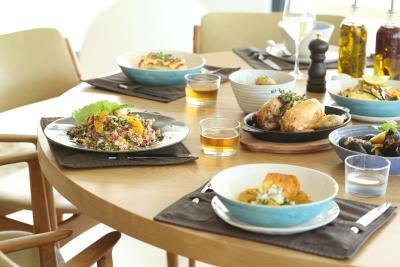 We had lunch and dinner in the hotel's restaurant and the menu and service were both excellent. We chose a partial sea view due to price. It was close to the working harbour. Noise throughput the night and views less spectacular than front rooms. 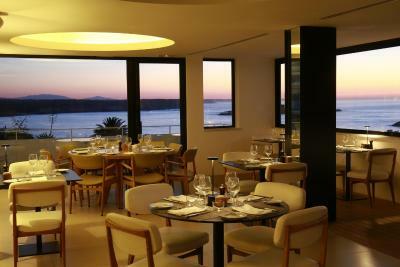 The restaurant in the hotel was very good and very good value. The restaurants nearby were very over priced with average food. No Coffee or Coffee maker available in the rooms. One of the reasons to book this hotel were the great reviews on the staff. And even though we had quite high expectations from start, we were still surprised by how great our experience turned out! The staff was just amazing! We felt pampered at every single moment of our stay! Congrats for the hotel manager for making your team work so well! We loved eating at the hotel restaurant: the food was just delicious and the friendly service made it a wonderful experience every single time. The breakfast was also delicious! Pastries fresh and tasty every morning. 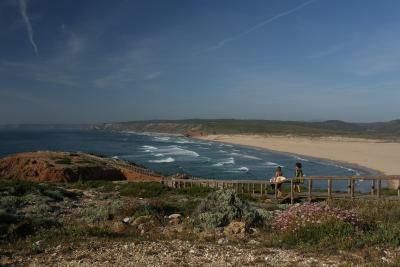 We stayed there for a week and were driving from there to visit the southern and western coast of Portugal. 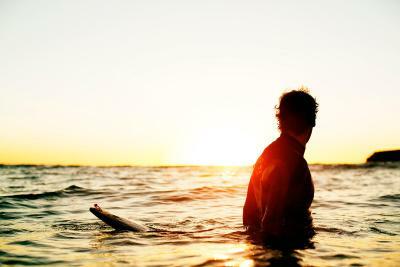 With its calm location, it was a perfect choice. We would definitely recommend this hotel! Love the breakfast and the pizza for dinner. Amazing views and comfy beds.